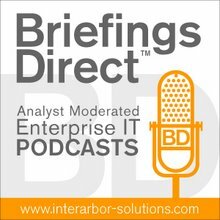 To learn more about the trends that are making business networks more powerful and more important than ever, BriefingsDirect recently sat down with Marshall Van Alstyne, Professor at Boston University School of Management and Research Scientist at the MIT Center for Digital Business, and also Tim Minahan, Chief Marketing Officer SAP Cloud and Line of Business. The panel is moderated by me, Dana Gardner, Principal Analyst at Interarbor Solutions. Gardner: Professor Van Alstyne, this is a tricky time for companies. It seems that they want to retain what works, the business models that have been tried and proven for them. They like having big margins, of course, but in order to grow and to be part of the future they need to expose themselves to these networks, take some risks, maybe lose margin in the process, but perhaps get scale and automation as a payback. How do you view that? How do you see companies adjusting? Is this a cultural thing where some companies will take this plunge and others don't? It does seem to be a perilous time for companies. I hope they're not just freezing in the headlights. Van Alstyne: It’s a great question. There are a couple of elements and they vary based on the where the company is currently. If it’s a relatively virgin market, then it’s fairly straightforward for them to invite others in, create the platform, and expand out in that direction. If it’s an existing market for them, they really have to worry about managing the cannibalization question. I know SAP has also had a very interesting example of that, as you move from on-premise services to hosted services. They're doing a nice job of managing that migration. It’s a little bit tricky in terms of how much you expand the market, but you really need to. You have to realize that the scale, the innovation, the customer engagement happens on these business platforms. Long-term, one really doesn't have a choice. One of the arguments that we typically make is that even weak platforms tend to beat very strong products. You can look at any number of examples, whether you take a look at the Blackberry, the Sony Personal PlayStation gaming device, or the Garmin device for GPS. All of these functions are effectively absorbed into the platform. If you manage a platform ecosystem, where third parties can add value on your behalf, you'll grow faster. The platforms almost always will be products. So, in the long-term, companies don't have a choice. They have to move in this direction. Gardner: So if it’s inevitable that you have to change, it sounds to me from what I've seen at SAP, that they're recognizing this. They're dealing with it themselves as a company, but they're trying to put together a safe path for enterprises to expand into the networked economy. At the same time, they can have trusted partners for automating a lot of the behind-the-scenes activity and allowing them to still function within their business verticals to know what their intellectual property is and to extend to it. Let’s go back to Tim. Am I reading that right, Tim, that SAP is trying to be, in a sense, the arbiter between risk and exploration when it comes to the networked economy? Minahan: That’s an accurate depiction, Dana. Think about our personal lives. Whether we're engaging family and friends on Facebook, buying a book or a blender on Amazon, or trying to capture transportation services to get downtown during rush hour on Uber, we're experiencing the scale and simplicity and convenience of personal networks. At SAP, we believe that solving this inter-enterprise collaboration challenge is one of the biggest opportunities of our era. We run our daily lives on them now. Unfortunately the business world traditionally has been optimized within the four walls of the enterprise. Companies have invested billions over the past 20 to 30 years in re-engineering their processes and investing in systems to really automate those internal processes and information flows. They have created what have become islands of efficiency that work very well, and continue to work well, for those that are highly vertically integrated, but very few are, as we talked about earlier. At SAP, we believe that solving this inter-enterprise collaboration challenge is one of the biggest opportunities of our era. We feel that we're well positioned to do that and have been assembling some of these business networks. We've had the acquisition of Ariba and Fieldglass in the area of contingent workforce and, with Concur, now in the area of travel and expense. We're complementing that with network extensions of our own, both through the addition of things like the product sustainability network, which leverages the existing connections within the network to help companies better perform tracing and tracking of their products, and the financial services network, which really facilitates and aids payment. What we're looking at is an opportunity to extend existing IT infrastructure and business process outside the four walls of the enterprise in the most scalable and efficient way possible, no matter what systems a particular company or their trading partners use, all through a single integration point. Think about Amazon in your personal lives. You don’t worry about integrating tier trading partners or how you are going to sell that. Amazon takes care of that for you. That’s the same metaphor that we're attempting to carry through into the business world by providing single standard integration adapters or on-ramps to the network that allow you to manage this virtual enterprise in a highly transparent and highly efficient manner. Gardner: Professor Van Alstyne, we've seen a great deal of network effects in business over the past decades. Yet nowadays, the confluence of cloud, mobile, and social and an emphasis on data-driven business processes seems to be accelerating and empowering these shifts. Some organizations call this the Third Platform. How does your research define business platforms, and how are the impacts from these Third Platform technology advancements newly impacting businesses? Van Alstyne: I emphasize the network effect as one of the driving forces. Indeed, if we can create a positive feedback loop throughout the network effects, that’s where you see the efficiency in the scale happening so quickly. In terms of a definition, we focus on two elements of the platform. The first is an open architecture that third parties can build upon. The second is the governance rules. How is it that people can participate? Why would they participate? How do you share the profits? How do you resolve conflict? You think about it as a nexus of rules and architecture. If you can put those two things together, you can probably grow an ecosystem that helps to foster and stimulate some of those network effects. Gardner: Tim Minahan, SAP has been a pioneer inside the four walls of the enterprise over the years with enterprise resource planning (ERP) and other business applications. Now, it seems as if you're recognizing what Professor Van Alstyne has been describing with these network effects and extending your value and business insight and processes across multiple boundaries, outside the four walls of any given enterprise into entire ecosystems. Minahan: We truly believe that the next wave of business productivity is not going to come just within enterprises, but between them. Forty years ago, when SAP arguably invented the whole concept of ERP, businesses were operating much, much differently. We showed them a new way to automate their internal information and process flows, but they were organized in a much more vertically oriented fashion. The employees would graduate from college, spend 40 years with the company, get the gold watch, and retire. Companies owned most of their infrastructure, their manufacturing facilities, their inventory, their shipping fleets, but certainly this is not your father's business environment anymore. In part, this was accelerated by the recession that we're still emerging from. Companies are less vertically integrated than they were in the past. They've adopted more variable operating models. They've outsourced everything from manufacturing to customer service, and they need to reach and compete with companies across the street and on the other side of the world. And this is creating new opportunities, as well as new challenges, for businesses today, and it’s increasing demands and expectations on individual functions of their teams. You're seeing it everywhere. If you have an iPhone, look on the back. It’s designed in California by Apple, but it's built, shipped, and serviced by someone else entirely. Even beyond the physical device, Apple makes most of its revenue from network-based services. iTunes relies heavily on an ecosystem of mobile carriers and artists and studios. Now, we're seeing this move into the business world, in which companies need to rapidly organize this virtual enterprise, all these resources of employees, manufacturing capacity, logistics, delivery capacity, and customer service to take advantage of certain market opportunity. Or, they need to adapt very quickly to certain market changes, and the only real way to do that is through a digitally connected network of partners, customers, and supply chain. Gardner: As the very nature of corporations change, it's really about relationships, data, and feedback loops. The data-driven organization, is it really about that. Are we losing something, are we gaining something, or both, Tim, as we seek this new definition of a corporation? Minahan: We're entering an age where the borders between enterprises are being taken down. Companies are moving toward a model where they're managing pools of resources, whether that’s pools of talent around expertise, as you just indicated Dana. A third of a typical workforce is no longer on the company payroll. It's contingent, statement of work (SOW) workers. In some industries, it’s already more than half. This is fastest growing part of the workforce. HR executives, and I talk with many of them, are beginning to rethink what constitutes the workforce and are looking at pools of talent. A third of a typical workforce is no longer on the company payroll. It's contingent, statement of work (SOW) workers. They need to understand where the skill sets lie, not necessarily what roles someone plays today, what skills they have had in the past and be able to, when a particular opportunity or project arises, assemble that expertise very quickly to address that particular project, and disassemble them just as fast, but retain the knowledge within the enterprise for the next time that comes up. The same thing is true if you're organizing a supply chain and need to be able to serve a new market like China. Where do you put your manufacturing? How do you address distribution, value-added taxes, and customer support. Traditionally, the model would have been to go and establish your own manufacturing facilities, build your own local agents, but no longer. Now you can quickly assemble and address, or test, a particular market or test a particular product in any given market. Should it work, scale it up. Should it not, scale it down and move on. Networks allow you to achieve this. I wanted to go back to something that Professor Van Alstyne said that's critically important. I fully agree that the networks go through phases. The first phase is to connect all the various parties, whether they be people, businesses, merchants, banks or all of the above. The second part is to automate their existing processes. What gets really exciting, once you've automated these processes, once you have these parties collaborating or transacting its scale, are the new insights and entirely new services you could enable. Once you have these millions of companies or people transacting at scale, you can see the transactional or relationship information. It could be the generated content that helps all members of the community make more informed decisions whether it's about buying or whether it’s about, should I bid on a particular bit of business as a seller or as a bank, mitigating risk in lending to allow them to understated who the buyer is, who the seller is and what their traditional history is. That is the ultimate big data opportunity, when you have these networks operating at scale. We're beginning to deliver this networked intelligence in the form of insight services to help our members of the communities make important buying, selling, and financing decisions in ways that they couldn’t before. Van Alstyne: Dana, let me jump in for a second. One of the things that Tim just said is quite important. One of the most interesting elements of the platform is the extent for new business services and new products to emerge. One of the Silicon Valley descriptions of the platform is that you know you have one when your community takes it in a direction you didn't expect. One of the most interesting elements of the platform is the extent for new business services and new products to emerge. You need to have made it possible for that. The underlying architecture needs the support the ability to develop something new that wasn't expected, but that’s one of the ways the platform adapts to create new value. The communities start to add new value and new services in ways that the platform meets the needs of the ecosystem, so it’s this ability to turn out new sources of value based on the underlying architecture. This is one of the key distinctions of platforms that really do add value. Minahan: I totally agree with that. We've only just entered it into this networked economy or networked era. One of the most exciting things is that it allows you to begin to entirely rethink traditional business models that were organized in an era where, to use an economic term, transaction costs were extremely high. Look at Uber, what Uber has done, and the challenges we're now seeing around challenging the traditional medallion livery service. That was organized out of a very real concern around safety and issues, but over time, that model matured and unfortunately got very costly. What you saw were the medallions being aggregated in the hands of a small few who could afford them. That obviously had some implications on the level of service and cost of service to employers. Now we've removed all of the transaction costs and could add up efficiently match demand -- i.e. you as the traveler -- and supply literally anyone that is a card-carrying member of the Uber service. That’s an entirely new business model that is fundamentally challenging hundreds of old rules and thoughts about what it means to hail a cab. So let me toss in one additional principle that’s often used for design. I'm thinking exactly of the Uber example. One of the best ways to view a platform is that you have the best platform and the transaction cost are the lowest. If you can get those lowest transactions, you're going to get more business taking place on that platform. So do whatever you can to see if you can lower those transaction costs to get the business going. Gardner: So we've taken a look at the inevitability of these networks. We've seen them already very prominent in the business to consumer (B2C) space, consumer activities, and commerce. We’ve recognized that openness is important. So we have innovation. We also recognized the importance of governance and management. So how do we know when we've done this correctly? Is there a sign? Professor Alstyne, you've mentioned a few that describe powerful and successful networks. Do enterprises have to view themselves differently? Do they need to look at participants in their network as a metric rather than just margin and net in gross revenues and incomes? Is there a way to be successful? Van Alstyne: Platform businesses behave differently than traditional businesses. Silicon Valley had been using lot of these metrics for engagement. How many new users do you get, and how engaged are they with the platform? It’s a wonderful place to start. Let me give you three rules that we like to use for platform design that actually help get the system running smoothly. One of them is "frictionless entry." You would like to make it as easy as possible for people to get onboard your platform. It doesn’t matter if that user is on the developer side. You want folks to be able to enter the platform as easily as possible. If you're bringing in apps in your ecosystem, your users are going to get a bad experience if they are low-quality apps. The next one is that you need to manage "riskless quality." If anyone can participate, there's a danger that folks who actually get onto the platform don't necessarily add value or they may try to siphon off value. You may worry about lower quality. Atari fell apart as a platform when it got low-quality games on it. Uber has to worry about low-quality drivers. If you're bringing in apps in your ecosystem, your users are going to get a bad experience if they are low-quality apps. So you still need to have riskless quality. The first principle is frictionless entry, and you need to manage riskless quality from the users on that side. The third one is "permissionless innovation." You don't want your developers to necessarily have to come to you to get permission. There is always this danger because you own the platform. You have enormous power over them and you could simply take that idea and run with it. You need the ecosystem partners to be able to run with an idea and create something novel on their own and let them have that value. They don’t need to get permission first. These are three rules that we use for design -- frictionless entry, riskless quality, and permissionless innovation. Those are really good guidelines and are helping to get these ecosystems to grow quickly, get more users onboard, and get your value add from third party participation. Gardner: Tim Minahan at SAP Cloud, tell us a bit about what you're doing at SAP, some of your acquisitions, besides your cloud, this ability to be frictionless and help people come on the network easily. You recently finished up the Concur acquisition, one of your largest ever. Explain how you're growing the size of your network? Minahan: What Professor Van Alstyne just talked about are principles that we subscribe to. In a business network sense, it also requires you to be open and application agnostic and largely agnostic to the on-ramps. That’s part of the frictionless entry. So regardless of what system you are using, whether it’s SAP, Ariba, Concur, Oracle, PeopleSoft Info, etc., you need to be able to attach the systems to the network, those demand systems that allow you to connect and collaborate through the network to extend that business process and engage with your customers, suppliers, and other partners. Think about our personal lives, whether it’s Uber or Amazon, those networks that are most powerful and most impactful on our personal lives allow a seamless process. You don’t even think about the process, but it is end to end. In the case of Amazon you don’t think about the buying process -- how am I going to connect to those individual merchants? They're already connected for you. Ultimately, you believe you're buying from Amazon, but you might be buying from an independent provider and they are still delivering to you. Those networks that are most powerful and most impactful on our personal lives allow a seamless process. Likewise, you don't think about, gee, now that I have placed the order, do I have to call my bank to settle out? No, that’s handled for you, SAP has been using these guiding principles to go out and make sure that we're building the network appropriately, both in our organic means through innovation and the introduction of new services, like payments, financing, and dynamic discounting, both independently with other members and financial institutions of the network, as well as inorganically through acquisitions. Gardner: As we close out, we've determined that the number of participants and the value of the commerce is super important in these networks. Several times we've also touched on this feedback loop in the data. So as we look to the future, we might have competing networks. If we assume that those networks are going to have some frictionless ability to move on and off of them, then the best network is where people will go. Is the best network the one that provides the best insights in data? Can we close out our discussion by looking at the importance of shared data and analysis and the ability to counter that analysis up from these transactions as a differentiator going forward that will pick winners and losers in open commerce network environment, if you will. Let’s go to Professor Van Alstyne first. Who is going to win in this network environment and is the data and openness and availability of analytics going to be a major determinant of that? Van Alstyne: I am going to argue the best platform is the one that creates the most value over time and that probably means that the data analytics, those that can use the data to create these data-driven feedback loops, will be the winners. One of the things that I want to emphasize is that frictionless entry and the ability of the movement of data doesn’t necessarily mean that switching costs are going to be low or that it’s going to be easy to necessarily change networks. Network effects do create winner-take-all markets, they do create these behemoths. Google Search has 67 percent market share in the US and 90 percent in Europe. Facebook has 1.3 billion users. I think Amazon web services has a huge proportion of the cloud services. We need to be careful if we think we're going to be able to switch networks easily. There are going to be some very substantial winner-take-all networks and some concentration at the top. Cloud and data is going to be an integral part of that, as the data creates these data-driven feedback loops that support these network effects. Minahan: I agree with the professor that the key litmus test of who wins is the platform or the network that creates the most value, and I think value comes in a few flavors. Number one is relevancy. Are my trading partners there? At SAP, typically about half of any given company's trading partners are already connected in transacting. That makes the frictionless entry that much easier. Think about Facebook. Why would you join any other personal network when most of your friends and family are already there. The second is the aspect of value. Can I manage most of my collaborations in a single environment or do I need to join multiple networks in order to complete a transactional process? The more capabilities you can layer in to make it more convenient for all members of the network to collaborate, the more value add. The more capabilities you can layer in to make it more convenient for all members of the network to collaborate, the more value add. And third, I believe that we've only scratched the surface on these insights. I wouldn’t even say that it’s a two-sided model. It’s a multi-sided model, where once you get these parties collaborating at scale, the transactional relationship and community-generated content can deliver new insights to help folks make more informed decisions, whether it's, which trading partners to do business with or which areas of your existing supply chain might be presented with risk in the future and you need to adapt quickly or which financial settlement options you have to settle out to help you optimize cash flow. These are new insights that were previously impossible with traditional on-premise and point-to-point integration models and it can only be accomplished in a network model. Gardner: I'd like to thank out panel, Marshall Van Alstyne, Professor at Boston University School of Management and Research Scientist at the MIT Center for Digital Business. And I'll alert our readers that there will soon be a new book called "Platform Strategies" out in 2015 from Professor Alstyne and co-authors. Also a big thank you to Tim Minahan, Chief Marketing Officer, SAP Cloud and Line of Business.